“Study skills for students with dyslexia” fills an interesting gap on the market. On the one hand, there are many books available about reading skills or organisational tools for dyslexics. On the other hand, many publications deal with study skills. But it seems that there are not any other guides or books available that combine the two areas – study skills and dyslexia. 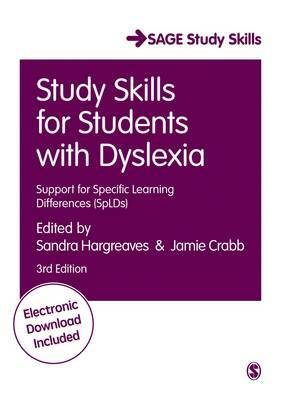 And as such I was interested in this particular book by Sandra Hargreaves and Jamie Crabb, who both specialise in work regarding Specific Learning Differences, such as dyslexia. The book is divided into thirteen chapters, which aim to cover every aspect of studying from organising and note-taking to revision techniques and help with numeracy skills and writing longer assignments such as dissertations. So this could not have been more comprehensive. The guidance provided is relevant and communicated in an accessible style. It almost feels like the authors talk to the reader and explain their suggestions and approaches to studying. The title suggests that this book is aimed at dyslexics, but I would argue that the recommendations would be relevant for all students irrespective of whether or not they are diagnosed with learning difficulties. And what is more important, for dyslexics this book is perhaps not presented at its best at all. This is due to the formatting more than anything. The purely black on white writing is harsh on everyone’s eyes. But the pages contain so many bold phrases that the pages feel restless and difficult to read, even for someone who does not struggle with learning differences. What I particularly liked, are the many links to resources and templates that students could possibly use to try and make their work more organised. Again this makes me think that all students even within sixth forms would potentially benefit. For example, on page 180 there is a link to an Excel file that would help students create their own exam and revision timetables, and thereby potentially encourage develop independence in learning and avoiding last-minute cramming or procrastination. I think the ideas are fabulous, relevant for undergraduate students and certainly helpful in preparing for life at University. However, I would not necessarily recommend this book for dyslexics, as I found the pages difficult to read. Instead, I would recommend the book to those working with sixth formers and dyslexia support staff to help prepare all students for studying.